I am still waiting to hear about Hurricane Sandy’s effects on Governors Island. There hasn’t been much news, though from what I understand the island took on a considerable amount of water. One of the piers also seems to have been destroyed. When things settle down I intend to email some of the ranger staff to find out what I can. Ellis Island got hit pretty hard but there seems to have been no structural damage or harm to the museum. The immigration building is so strong it’s hard to imagine anything happening to it. The Statue of Liberty did get hit hard and, what’s worse, the hurricane came just a week after the reopening after extensive renovations. It’s still too early to tell. Castle Clinton in lower Manhattan took on considerable water. When I do my tour at Governors Island I always take visitors to the spot just behind Castle Williams where one can see most of the harbor forts. From that spot one sees how each fort is part of a larger puzzle. It was our good friend Sami who talked me into transferring from Ellis to Governors Island last year. The logic was that it would allow me to concentrate on the Civil War Era, which for me spans the lifetime of the generation that fought the war. What is so fascinating about the harbor is that so many people who fought in the war spent at least some time there. Katie Lawhon of Gettysburg National Military Park had a similar experience when she was detailed to help get ready for the reopening of Statue of Liberty National Monument and got a taste of that history. Here’s hoping Lady Liberty opens soon. 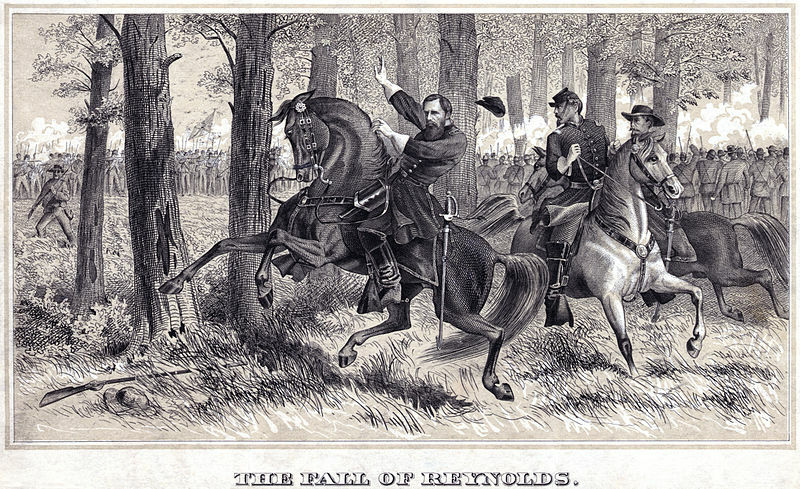 General John Reynolds, depicted here by Alfred Waud as he fell and died at Gettysburg on 1 July 1863, was one of the many Civil War soldiers who spent parts of their career in New York Harbor. In the mid 1850s he was stationed at Fort Wood, now the base of the Statue of Liberty.